I know that some of you are looking at that photo and saying, "Why is jo(e) posting a photo of a cat on a Wednesday? Doesn't she know that Friday is cat blogging day?" Of course, others of you are shocked to see a cat on the kitchen counter. You are thinking – how unsanitary, I am never eating at jo(e)'s house. But let me reassure you. Come to my house and there's a good chance that you will be eating delivery pizza out of a cardboard box. The habits of my cats will not be a factor. And to get back to that original question, this isn't a photo of a cat. Look closer. It's a photo of a white cloth. The white cloth is the answer to a question that several readers asked me a few posts ago. I had casually mentioned that I don't buy paper towels, that I don't like using disposable products, and other parents emailed me to ask, "What do you use to mop up spills? With all those kids, you must use something! Don't your kids spill stuff?" In fact, spills happen all the time in our house. I think teenagers are worse than toddlers when it comes to spills. First of all, no self-respecting teenager will use one of those little tiny sippy cups. No. A teenager will pour a huge quantity of weird red juice, like maybe a gallon or so, into a tall glass (or a vase if every glass is dirty) and then leave the glass on the floor near the feet of some other teenager who is practicing a Jimi Hendrix move with an electric guitar. In our house, someone it always eating or drinking something, and when you combine scattered half-filled cups and bowls with bizarre ideas like, "Let's throw lit matches on the floor and see if we can blow them out before we burn holes in the carpet," well, spills happen. When inevitably, the mug of hot cocoa gets knocked over by a kid standing on a chair to tack blankets over the window for an extra-dark game of Monster, someone yells, "Get some white cloths!" And one of the kids (usually an extra, not one of my own kids) will grab a handful of white cloths from under the sink, toss them on the spill, and jump up and down on them until all the liquid is absorbed. The white cloths then get thrown into a big plastic bucket that looks suspiciously like a diaper pail. When the pail is full, one of us (okay, usually my husband) dumps them in the washer with some detergent and bleach and washes a load of white cloths in exactly the same way you would wash a load of diapers. Diapers are, of course, the origin of the white cloth habit. For about twelve years, our household had at least one kid in diapers so we always had plenty of diapers on hand. And a thick cotton diaper is maybe a thousand times more absorbent than a paper towel. Who would use a paper towel when you could use a diaper instead? And besides, as I've mentioned before, I don't like to buy disposable products. When the kids were little, we washed diapers every other day, but then even after the last kid stopped wearing diapers, I saw no reason to get rid of the diaper pail. We went on using the diapers in all the ways you would use any kind of rag – to clean a sink, to mop up a spill, to wipe snot from the face of a toddler, to tuck into a kid's shirt as a bib, to toss on the floor when dripping wet teenagers come in from playing Ultimate Frisbee. When some of the diapers wore out completely, I replaced them with generic white cotton cloths sold at a wholesale club. We stopped calling them diapers, because white cloth just sounds so much classier. When we go on car trips, we grab a stack to toss in the car with us so that everyone can put one on their lap when they are eating sandwiches that drip with salad dressing. When I carve a watermelon, I toss white cloths underneath the cutting board to absorb all the juice that runs off. When a kid comes in with an injury, I put ice cubes in a white cloth. When we bring in our icy snowboards and prop them in the hallway, we put white cloths underneath to absorb the melted snow. When I accidentally give a plant too much water, and water comes pouring out of the bottom of the pot, dripping down onto the carpet, I grab some white cloths. When the kid who is standing on the table to duct tape toys to the ceiling fan knocks a bowl of soup to the floor, I grab some white cloths. I don't know how any household manages without them. Our cat sits on the counters too. All our friends except one have gotten used to it and moved on, figuring that they haven't died from eating at our house yet. And what a brilliant idea that is so simple! I am going to implement a similar idea at our house. I always avoid the kitchen towels for messy spills because the towels ended up ruined, but never thought about bleaching white ones (laundry is not my strong point). Thank you!!! The white cloths are a great idea. We're sans kids so we've never had the diapers to recycle. But what we do have are lots of clapped out t-shirts. I cut them up and store them under the counter in a wire basket. They get used much the same way as your white cloths. And since the source t-shirts tend to be dark green or black, we don't bother with the bleach. It's cheap and it's easy. In our house the diapers are still in use, so I cut up an old beach towel into wash cloth sized pieces. It saves us a bunch of money. I used to use rags, but gave up because they weren't getting washed frequently enough. I went back to paper towels, trying not to feel too guilty becasue I composted them. When we moved I found a stack of diapers in the back of the linen closet. I think they just might make an appearance as "white cloths" and see if we can wean ourselves from the paper towels (or at least cut down). Is no one going to point out that the cat is sitting in a colander? I mean seriously, people, that's the best thing about that picture! Wow, this could be a story from our house, if only the cat in the colander was swapped out for a ferret in a large flower pot. We use those thick cloth diapers for every imaginable spill. We line the ferrets' cage and carriers with them, and we use them to dry off the dog after baths. And of course we still use them as diapers. I do have paper towels because we have a few guests who are icked out by wiping up spills with diapers, but we use maybe one roll a year. I remember the white cloths from when I came to visit. Not having the category "white cloth" in my mind, I think that I thought of them as washcloths. And, yes, the cat in the colander is beyond adorable. jo(e), you are brilliant on so many levels! Only Jo(e) can take a white cloth and turn it into a post that is relevant, smart and interesting. I also use white cloths. With 5 pets I would run through paper towels way too fast. Plus they last forever or seem to. My kids have yet to duct tape things to the ceiling fan though. That would be cool. We also have such cloths, big ones that we throw over the whole spill. So your cat was hoping for a good rinsing, correct? OK come on now...all us cat owners out there know that it really is all about the cat. I love that you could have just answered those comments (mine was one) by saying "we use white cloths," but instead we got this funny, informative post. Thanks! Hey, I thought you never put faces on your blog! And do you still actually use your bread machine? Or is it taking up space on the counter like ours did for several years until we finally got rid of it? Okay... so now two cats have showed up in a row. How many more? Rana: Well, we've got seven cats so it's hard to take any kind of indoor photo without a cat sneaking into the photo. Dr.K: Shaggy Hair Boy is in charge of the bread machine. He goes through spurts of making bread, but then sometimes it just sits on the counter for months. I've never actually used it myself. I ove the way the whole house smells when bread is baking though. I love this post...not only for the usefulness of the white cloth, but for all the glimpses into the workings of your household. It is always bursting with robust teenage life, isn't it! Sounds like a lot of fun! we buy huge stashes of rags and washcloths for all the same reasons. Plus, cloth FEELS so much better than paper! Rana: Oh, I should also have mentioned that you can buy cotton handkerchiefs in the men's department of any department store. That is what my parents use -- they last forever and get softer every time they are washed. What would be cheaper, though, would be to buy old bedsheets at a thrift store and cut them up. The second thought I had after reading your post was, "I need some white cloths!" The first thought I had was, "Lucky cat...gettin' all snuggly in a strainer...."
I run a load of them in hot water and bleach twice a week. We are a washcloth family also. Have been for years. Just makes so much more sense. oh my gosh, i totally thought growing up that my family was the *only* one who did that! we have tons of white cloths, they were at first diapers too. thanks for this story!! You've talked me into it. As soon as the current giant C0stC0 pack of paper towels is gone, I'm gonna buy a big buncha white cloths to add to our small buncha diapers. I am also a white cloth devotee. :) My usage of white cloths also came from doing diaper laundry. Once I switched from disposables to cloth, I looked for other ways to reduce my dependence on throwaway items. My white cloths are terry cloth automotive towels, though, not actual diapers. I love them, they are so useful and very easy to keep clean. I haven't bought a paper towel in a long, long time. The white cloth idea is a good one, but what I've really got to comment on is the kitty! My favorite thing is the expression on his face - it's like he's saying, "Look, I'm so LITTLE! 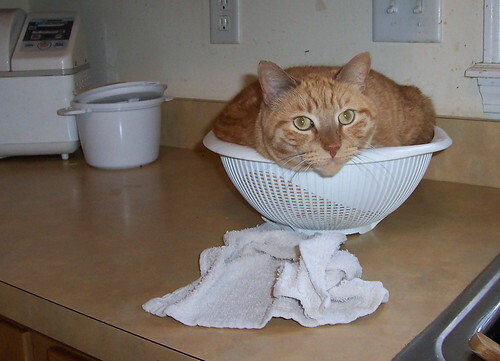 I can fit in this tiny little colander!" We have those same white cloths :). Although I do have to report that Hubby is a lover of paper towels, comes from his childhood. They are on the counter, but I rarely use them. I love the white cloths. They are cheap, like 8 for $4 or something. This is not a proper photo for the blog. I can't believe you showed the cat's face! Linda: It's true. I don't protect my cats from stalkers. The cats don't get pseudonyms either. This one's name is Rachel. I figure the names we call cats aren't real anyhow; I mean, I don't know what the cat's real name is since I don't speak cat. rachel is quite a cat! we have more of a cat on table problem. nobody really notices the counters, do they? I have ONE white cloth a dear friend gave me (we won't mention that her name starts with j). AND a whole bunch of old used towels I now use for white cloth duty. But the others in the household don't get it. Graham is forever using a paper towel to heat a bagel in the microwave and then THROWING IT AWAY! BLASPHEMY! (I usually drag it back out and use it for something). My kids aren't as well-trained as yours. Sweet kitty. Keep those stalkers away! LOL! Mary: Hey, one of the first times we ever read together, you read a poem about paper towels. Remember? It was dedicated to Chuck, I think. The whole poem was about trees and leaves unfolding, and ended with, "Think of this the next time you grab a paper towel to dry your hands and toss it in the trash can." I haven't bought paper towels since. My kids aren't really well-trained; they just don't have the option of using disposable towels because there aren't any in the house. this might be a story from our house, i love your style in blogging you convert a simple story to nice blog post i try to do this in my Blog which talk about Romantic vacations and Travel insurance .